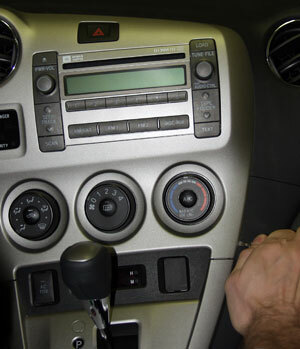 Below are the general guidelines for connecting Grom iPod interface to the Toyota Matrix 2008 car stereo. 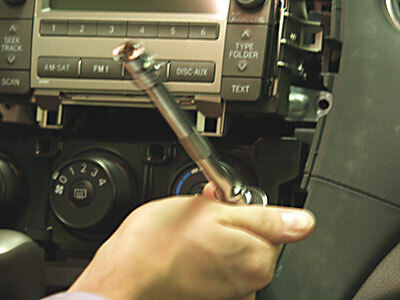 The installation of GROM adapter requires you to pull out the car stereo in order to access the CD changer port located at the back of the car radio. Using screwdriver carefully detach the decorative cover. Unscrew 4 10 mm bolts located at the stereo corners. Be careful not to loose them! 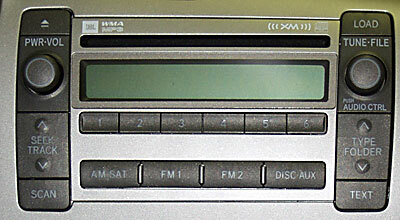 Carefully pull out the stereo in order to access 12-pin port at its back. Don't disconnect any wires, the port should be empty if you don't have navigation or XM installed. Take TOY cable and connect it to this 12-pin port. If the port was occupied by other factory connector, plug this factory connector to the female end of TOY cable. Connect the other end of TOY cable to the GROM box and iPod and test the functionality. If there is any problem - see troubleshooting section in your User Manual. Once functionality is confirmed disconnect the TOY cable. We recommend glove box installation. For glove box installation slide the TOY cable through the glove box hole (pull the glove box down before doing that) from the glove box to the back of the radio. Connect the TOY cable to the 12-pin port again; connect it to the GROM box. Connect the iPod cable to the GROM box and to your iPod. Make sure that the contacts are solid. Pull the stereo back and secure it with 4 screws in the corners. Install back the decorative panel. Start from the top and make sure that all clips are properly aligned. Congratulations! Now you can use your GROM adapter with your car stereo! !